The photojournalists of the Kashmir valley are being targeted intentionally by security forces from time to time. These journalists are showered with pellets while covering the gunfights in the valley. Earlier, they were also being targeted by the police and NIA for doing reports on the militancy-related issues. The while discourse changed after the killing of Burhan Wani, who was as a poster of Kashmir. The journalists were under tremendous threat while covering the reports. On 21st January, a gunfight broke out in the orchards of Heff-Shrimal village of Shopian district, in which 11 persons including four photojournalists were showered with pellets. Among them, one journalist Waseem Andrabi got six pellets on his face. However, Andrabi have been luckier coming out of the site of a protest near the encounter site that broke out in Shopian district some days before. 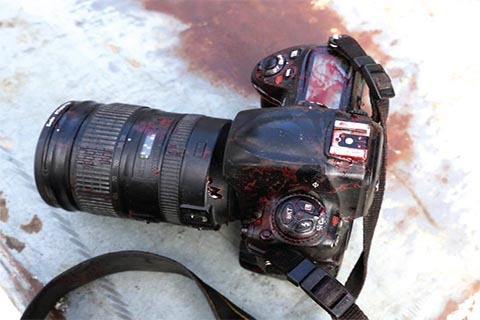 The incident became one of the latest headlines to highlight the hazards of photojournalists of the Kashmir. According to Waseem Andrabi, who is working with Hindustan Times Newspaper that Clashes were going on, I along with five other photographers tried to move towards the forces side. Two among us were wearing bulletproof vests with ‘Press’ inscribed on them. Another was also wearing a helmet with ‘Press’ vividly printed on it. I also raised my camera as a signal to forces personnel. Then suddenly a cracking sound comes. “I felt itching on my face. I caressed my face with hand only to find blood. I found Nisar (another photojournalist) lying on the ground. After some time, we gathered ourselves and got some medication from a local chemist, before going to a hospital,” said Andrabi, whose act of helping an injured CRPF man in Budgam last year was lauded by top brass. The president of Kashmir Photojournalist Association (KPA) Mukhtar Khan stated the incident as a cowardly act and said that showering pellets on his colleagues is a signal for scribes to not report on the ground. He further said that the camera or writing pad is our identity and when it is not respected, what does it denote. “It is a clear indication that security forces want to bar us from reporting the ground. When this matter was discussed with top security persons, who assured us of action, but mere assurances would not work,” Khan said. Another journalist, Junaid Gulzar who is working with Kashmir essence stated he was also there to cover the encounter between militants and security forces. But the security forces used high hand towards us. I also got pellets in the neck, while other friends from different news portals got pellets in face and eyes. Talking on Phone, Junaid stated that this is the not the first time when we were welcomed with pullets. Our lives are under threat and we think so many times, whether to cover the report or not.